In the German legend, Dr. Faust trades his soul to the devil in exchange for limitless knowledge and pleasure. It’s moral lesson to all, as tempting as this is on many, many levels. Imagine the parties? 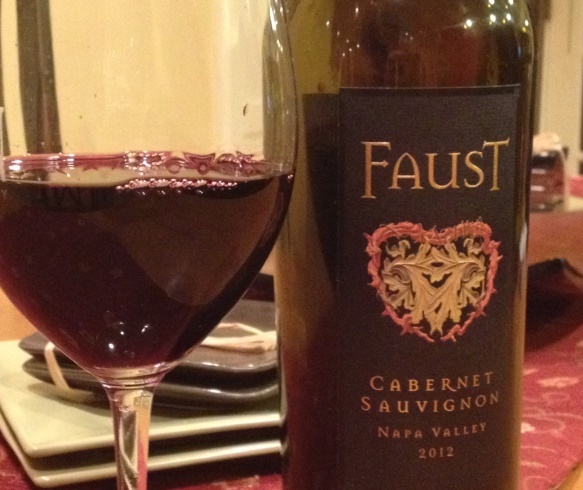 But while you will trade about $50 for the Faust Cabernet, made by the legendary winemakers at Napa Valley’s Quintessa winery, plenty of pleasures are found within the bottle. Quintessa has made its reputation in Napa by showcasing the strengths of vineyard sites within this famed valley, but Faust reflects a blend of Cabernet Sauvignon grapes sourced from AVA regions throughout Napa, namely Rutherford and Coombsville. This allows the winemakers to commingle subtle flavor differences and build a wine with rounded (yet challenged?) character. But it’s not just one, flat note. They crafted a diabolical blend of many different Bordeaux grape varietals for our drinking delight: 80% Cabernet Sauvignon, 16% Merlot, 2% Cabernet Franc and 2% Petit Verdot. The Faust 2012 Cabernet Sauvignon offers layers of complexity. Aromas of dark fruits of black cherry, plum, tinged with green tobacco float from the glass and meet, then meld at the palate crossroads. Here, dusty tannins, menthol, lush black fruit and a hefty helping of vanilla oak complete the negotiation. Elegant yet masculine, seductive yet forceful, this Napa Cabernet would make Mephistopheles proud.